This section is what happened to Ruthie after 1969. After the introduction of the new Ruthie face ca. 1967, her popularity lasted only a few more years. Perhaps the doll market was evolving. 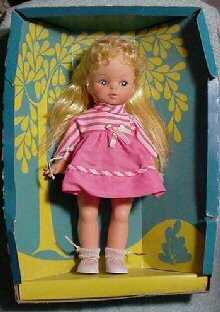 Perhaps she had been marketed as so many other types of dolls she lost her brand identity. I do not know. However, Ruthie underwent some last transformations. In 1970, the last year of Patiki Gibb's Horsman book, Ruthie is shown with a nearly identical head mold as she had since her "new face" ca. 1967. However, she now has side-glancing painted eyes instead of moveable sleep-eyes. Her body is very similar also, and she is listed at one size - the 14" size. 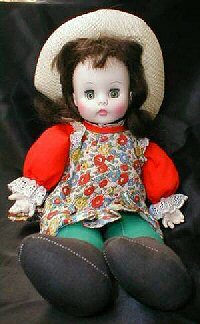 Sometime after 1970, the classic Ruthie head was re-introduced on a cloth body doll. My poor baby girl - where did you get those big clompy feet?